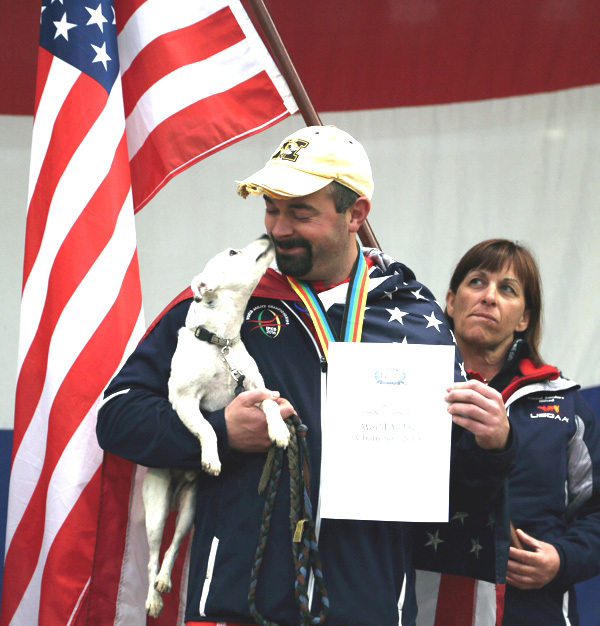 After the parade of flags and a brief opening ceremony, the first of two Biathlon classes opened the IFCS World Agility Championships. Team USA leads after the first round in the 30cm and 40cm height classes. Andy Mueller led off the class and holds a 1.39 second lead over 2nd place Russian team member Elena Grishina. Italy is in 3rd, just over 2 seconds out of 1st in the 30cm class. Marcy Mantel holds a 1.19 second lead over Italian contender Alberto Marmo, with a Dutch competitor in 3rd, just over 2 seconds out of 1st in the 40cm class. Team USA also holds 6th and 7th positions, with Karen Massey and Mike Padgett just over 4 seconds out of 1st. Top contenders in the 55cm class are Canadian Shauna Oliver, Jaako Suoknuuti of Finland, and Maria Metelkova of Russia, in 1st, 2nd, and 3rd places, respectively. All are within 1.06 seconds of each other. In the 65cm class British competitor Lauren Langman holds a fractional lead over Finnish competitor Janita Leinonen and Russian competitor Svetlana Tumanova. Team USA member Jamie Herren follows in 13th position, just over 3 seconds out of 1st in a hotly contested class. Day 2 of the IFCS World Agility Championships features Individual Snooker, the first of the Individual All-Around classes, and the national team Triathlon Jumping class. The Russian team dominated capturing 8 of 12 medals awarded in the Snooker class, with Canada, Italy and The Netherlands taking the other four. Day 3 of the IFCS World Agility Championships featured Individual Agility and Jumping, the second and third classes in competition for individual discipline honors and the Individual All-Around awards. Andy Mueller was the lone Team USA medalist, taking the gold medal in the 30cm class of the Individual Standard Agility class and the silver medal in the 30cm class of the Individual Jumping class. The other positions were dominated by the Russians, taking a disproportionate share of the medals. The standing in the All Around look hopeful for some Team USA members, with the standings as listed below heading into Saturday’s final round-the Gamblers class. 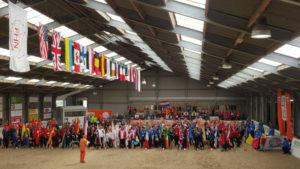 Day 4 of the IFCS World Agility Championships featured Individual Gamblers class, the fourth and final class in the Individual All-Around competition and the Team Triathlon Standard Agility class, 2nd in the series. Day 5 of the 2016 IFCS World Agility Championships featured the Biathlon Standard Agility class and the national team Triathlon Relay class. Team USA gave it their best but came up short to a dominant Russian team. The final award ceremony included recognition of the judges and volunteers, as well as the more than 200 competitors from 16 countries. Congratulations to all medalists! Thank You to Team USA!